The new business approach, "Enterprise Technology Solutions" (referred to as ETS) proposed by Yokogawa entails offering 'complete solutions' by employing leading-edge technology in every aspect of an enterprise's production activities. The CENTUM CS 1000 production control system for small-and medium-scale plants is a key component in this approach for the control of total industrial automation. 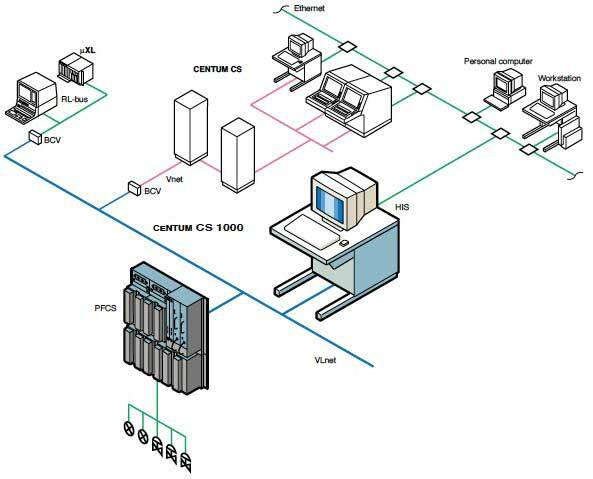 This paper introduces the concept and system architecture of the CENTUM CS 1000. These functions are closely related to the changes in plant operations, such as the expansion of processes controlled by each operator (i.e., the one-man operation), the integration of plants, the increase in production efficiency and the availability ratio. In order to add such functions, the control functions, human-machine interface, and communication functions were divided into control modules called function blocks, and the more-advanced functions that were required were configured by arranging these function blocks. Just as technology has changed rapidly, the world situation and environment have also changed dramatically. Economic changes have stimulated multinational production bases of manufacturing companies, and the procurement of not only base materials but also parts and assemblies, is now being pursued on a global scale. As seen by the trend toward ISO 14001 certification, public consensus has declared that it is unacceptable for companies to create any harmful impact on the global environment in the course of their business activities. From the viewpoint of DCS users, the required changes are obvious and DCSs should meet these changes appropriately. The rapid spread of personal computers and the decrease of hardware prices has caused users' perceptions of computers to change. They are now seriously assessing the return on investment of the various options that have become available. These include a system composed of programmable logic controllers and a personal computer with supervisory control and data acquisition (SCADA) software, a software-based programmable logic controller composed of general-purpose input/output devices and a personal computer, and other personal computer-based systems. DCSs are not only required to be a "no-fail system" (as determined by their price), but must also be flexible, allowing it to be configured to suit the exact purpose of the plant. Traditionally, companies developed their own information system. More recently however, they have started to employ an integrated business framework package to perform Enterprise Resource Planning(ERP) and the like, in an effort to reduce the cost and time of development as well as to achieve centralized management of data. Under this information framework system, the Manufacturing Execution System(MES) fills the gap between business and production control areas by supplying on-line control information to the information system. For this reason, the standards of data exchange such as ISA S88 and ISA S95 have gained importance. In addition, activities for standardizing the OLE for Process Control (OPC) by the Instrument Society of America's standard practice committee have also been significant as OPC is expected to become a concrete method of data exchange. Due to differences in the industrial development of foreign countries, DCS requirements differ between Western countries and Asia. For example in China and Southeast Asia, reductions in running costs are required rather than labor saving since labor costs are low. In Europe, the unification of the European Community has resulted in the demand for compliance to European standards, such as the CE mark that indicates the product's compliance to an electromagnetic compatibility standard. DCSs must meet the diverse requirements of global markets. Under such circumstances, the following four concepts were proposed for the CENTUM CS 1000 to target medium- and small-scale plants. The system offers a new standard of operability for plant operation and monitoring functions. Operation and monitoring functions are provided on a Windows-based GUI so that operators need not be retrained. The visibility and operability specifically required in plant operation, is not affected by this change, thus operators are presented with a truly user-friendly system. The system was developed as a low-priced system for the medium- and small-scale plant market, despite its unrivaled control functions, engineering functions, high reliability, and flexible expandability. To achieve this, general-purpose hardware is employed, and features that were once regarded as mandatory, such as system redundancy and an operation keyboard, are offered as options. To achieve these concepts, we employed an IBM PC/AT- compatible personal computer as the platform for operation, monitoring, and system generation functions, and Windows NT as the operating system. A broad range of personal computer hardware varying in both functionality and price, is available from a multitude of manufacturers. Windows NT is a well- renowned, genuine multi-task operating system. By employing Windows NT, various applications designed for Windows NT and its extensive interfaces can be used, both of which greatly help achieve the product objectives. For the control and communication functions, the key factors for system reliability, original hardware that incorporates Yokogawa's expertise and leading-edge technology is employed. 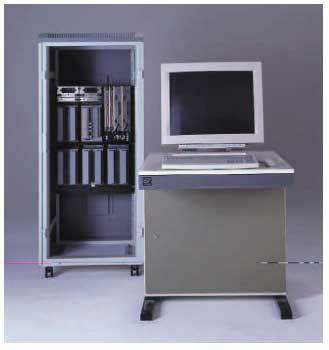 The minimum configuration of a CENTUM CS 1000 system is composed of a human interface station (HIS), a field control station (FCS), and a VLnet control bus. Figures 1 and 2 show the appearance and system configuration of the CENTUM CS 1000, respectively. An HIS is a platform running the operation, monitoring and engineering functions. Either a Windows NT 4.0-based personal computer or a Yokogawa PHIS which is designed to be environmentally durable and of high maintainability, is used. The use of the Windows NT operating system has enlarged the choice of hardware and peripheral devices available, allowing us to offer a system configuration suitable for the specific requirements and operating conditions of the plant. A dust-proof and drip-proof operation keyboard is available as an option. The field control stations most-recently developed for the CENTUM CS are inherited and combined with the synchronous hot-standby system of a duplexed CPU which ensures high reliability. The input/output units no longer re-quire signal conditioners and allow for highly dense installation, thus improving the space factor. These units are directly connected to the CPU to achieve a high level of performance. The configuration of each FCS is customized according to the required scale, functions, and reliability, as described below. Can be selected from two or five nests. Can be optionally specified for the CPU, power supply module, input/ output module,and control bus, respectively. Can be selected from the basic and enhanced models depending on the functions. Programmable logic controllers and data acquisition equipment from major manufacturers can be connected via a communication interface to enable integrated control with the FCS's control functions. The VLnet is based on the Vnet of the CENTUM CS and complies with 10BASE2. The transmission speed is 10 Mbps, and the token passing method is used. The PCI interface network-adapter card that is compatible with duplexed buses was developed for this new network bus. The VLnet is extremely versatile, allowing not only dedicated control protocols, but also TCP/IP and other general-purpose protocols to be used. Load distribution using the VLnet as the control bus and the Ethernet as the information bus, is also possible depending on the scale of the system. Screen mode: User can select between two screen modes. In the window mode, the operation and monitoring windows are displayed together with other application windows as with other Windows-based applications. In the full-screen mode, each operation and monitoring window is displayed as a full screen like a conventional, non-Windows control system. Hierarchial display of user-generated graphic windows: Hierarchical window switching and hierarchical alarm management are possible. Memory of opened windows: The currently opened windows are memorized as a group and the same windows can be opened later whenever needed in a simple one-touch operation. Operator announcements and steady operation even while other applications are running: The system message window that is the top of the window hierarchy keeps the operator aware of the current status at all times by issuing announcements whenever necessary. A circulate function switches from other application windows to the operation and monitoring window in a split-second, ensuring steady operation. Other features realized by using a personal computer as the operating platform, include long-term data storage up to the maximum available disk space, open data interface (described next), spreadsheet reports using Microsoft Excel, and extensive range of primitives for graphic windows. Open data interfaces are prepared for access to process data such as when a user's custom application is developed or data are exchanged with another computer system. Such interfaces include the conventional Dynamic Data Exchange (DDE) interface and the new OPC interface which is based on the OLE method. These interfaces can be used on the HIS itself or on a remote, networked personal computer via Ethernet without considering network access, thus allowing remote operation, monitoring, and data acquisition to be realized easily. Control functions are the most important factor of a DCS. The renowned control functions of the CENTUM CS have been incorporated into those of the CENTUM CS 1000 almost as they are. Extensive sequence coding methods: Sequential Function Charts (SFC),logic charts, etc. Unit instrument block simplifying the operation and monitoring of a set of equipment and control devices such as a distillation column and reactor. Engineering for a batch plant generally takes a long time since the sequence is complex and recipe switching is necessary, and also because it often requires complicated operations. The batch package of the CENTUM CS 1000 integrates recipe management and process supervision and is fully compliant with ISA S88, thus promising the efficient startup and operation of a batch process. For not-so-complex recipe management, an FCS data setting/ acquisition package is prepared and is useful for small-scale systems. A system conforming to the security standards of the Food and Drug Administration (FDA) is also available. The System View window displays the hierarchy of the folders containing engineering files. Double-clicking a file runs the corresponding builder. Data can be imported and exported between each builder and a text or comma-delimited file. Functional inspections of FCS databases can be performed using only a personal computer with the virtual test function. The debugging function enables the user to watch the testing of dynamic modification conditions on an open graphic window. The download procedure is designed to minimize the time taken to download databases to target stations (FCSs and HISs). The setting items are categorized into two levels so that the basic settings are usually displayed and a system can be configured easily using the basic settings. The same engineering databases can be shared by multiple persons over network for concurrent engineering. The entire documentation is distributed in the form of electronic media. The file format is Portable Document Format (known as PDF), which is becoming the standard format of electronic documents on the Internet. This format enables the user to open and refer to the documentation from the same personal computer on demand. The development of the CENTUM CS 1000 represents our first attempt at developing extensive application software for personal computers — a totally new approach for us. We believe this exercise has been extremely worthwhile and shall continue to sophisticate the CENTUM CS 1000 in order to provide an even more competitive product. NOTE: Product and company names that appear in this report are trademarks or registered trademarks of their respective holders.